Shopping for Daft Punk Action Figures? Amazing action figure for the hit band Daft Punk! SH Figuarts takes Thomas Bengalter to a whole new level. Measures nearly 6-inches tall with tons of articulation! From Bandai Tamashii Nations! The hit band Daft Punk gets the SH Figuarts treatment! 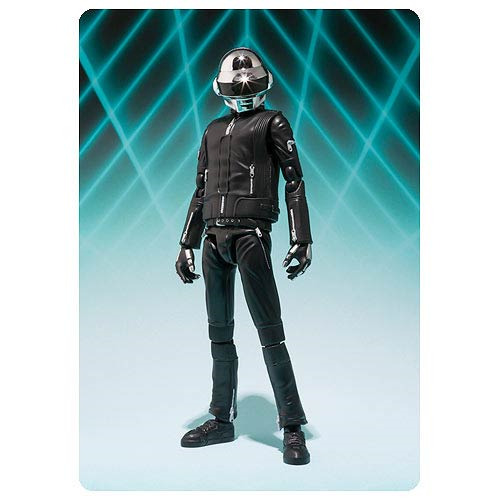 Honoring their attention to visual and robotic components, the Daft Punk Thomas Bangalter SH Figuarts Action Figure has been crafted with meticulous attention to detail. Supervised by Daft Punk themselves, there has been no detail left out. The helmet area employs a shiny metallic finish and clear parts for enhanced realism. Complete with all the advanced articulation of the SH Figuarts series along with a set of 7 interchangeable left and right hand parts for recreation of dynamic posing, this amazing action figure is ideally suited for displaying alongside the Daft Punk Guy-Manuel de Homem-Christo SH Figuarts Action Figure (sold separately). Measures nearly 6-inches tall! Ages 15 and up.